Core Video — provides a pipeline model for digital video and makes it simpler for developers to access and manipulate individual frames. In this article, I would like to draw your attention to the advantages and disadvantages of AVKit and AV Foundation. In addition, I will talk on the importance of following the iOS Human Interface Guidelines while building your media app. AVPlayerViewController is actually a substitution for MPMoviePlayerController (another native iOS class for playing video, which Apple deprecated in iOS 9). It has a simple but powerful interface—you can control video gravity, visibility of playback controls. An instance of AVPlayer to play media content offers you all power of AVFoundation. AVPlayerViewController doesn’t allow to specify custom controls, but it has a control panel with the standardized Apple user experience—play/pause, video scrubbing, timeline, etc. AVPictureInPictureViewController was introduced with the release of iOS 9 and available only on IPad. The idea of watching video and doing something else simultaneously is nothing new, but it provides great user experience. 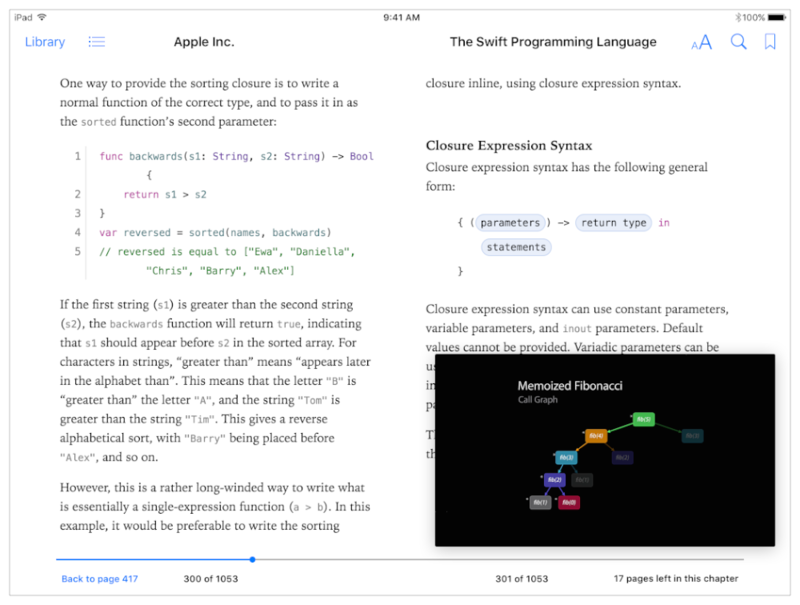 For an instance, you can both read your book and enjoy new WWDC session at the same time. It is necessary to keep in mind that this feature should be under user control, because any app invoking PiP without direct user perdition will be shut. edit videos (apply watermarks or compose a presentation from multiple video tracks). This framework provides us with the best performance on all devices using advantages of multicore hardware and extensive usage of GCD and blocks. Apart from the official Apple documentation there is a great book «Learning AVFoundation» by Bob McCune dedicated entirely to this complicated framework. The class is AVAudioSession another essential object that is used to set audio context for your app and to express the way your app interacts with the device. It is responsible for mixing or silencing audio. Apart from this, it is important to keep in mind that such operations as preloading media or retrieving metadata from the file are heavy operations. Therefore, you should use the Key-Value-Observing mechanism to keep user interface synchronized with media for the first one. To retrieve metadata, you can use asynchronous preloading. Another thing is that setting up the media pipeline of an iOS device might take some time too. That is why such features as Video Autoplay are bad solution. You should test all media applications on a real device to check the performance and delays, which might not occur on the simulator. To be honest, I cannot even imagine today’s world of videos without YouTube. 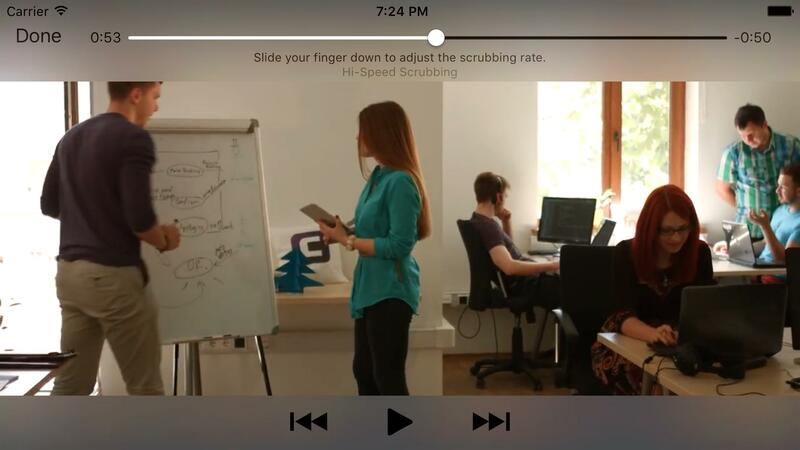 You can easily integrate native YouTube video player into your iOS application. It has a simple interface and integration is not complex at all. Moreover, you can easily display the controls and timescale the way you like, start play video from particular second, and hide the YouTube logo. You can build your own realization of YouTube player retrieving video by parsing data. Actually, you can get away with XCDYouTubeKit. It uses AVKit to play YouTube videos and has native iOS interface. However, according to YouTube Terms of Service, the only official way to play their videos is to run the native YouTube player. So the best solution here is to use the official product. While developing an app it is important to follow iOS Human Interface Guidelines. In media applications, you should provide a proper volume slider. Besides this, you should respect user privacy. Actually, in addition to performance, privacy is another significant issue of Autoplay. Just present some progress hud or pregenerated thumbnail before media will be ready to play. You can observe route changes via AVAudioSessionRouteChangeNotification posted by AVAudioSession. This notification contains info with the reason why the notification appeared and previous route state. That is why you should handle different interruptions. Apple distinguishes resumable and non-resumable interruptions depending on how temporary the interlude in their primary listening experience is. Resumable interruptions such as plugging/unplugging a headset, incoming VoIP call, connecting to a wireless audio device and non-resumable interruptions are media playback. For an instance, users expect the app to be silent in case of an incoming call; when the call is finished, the app is supposed to resume playing automatically. On the other hand, if the user paused the music playback before the call, the music is supposed to remain paused after the call ends. In case of non-resumable interruptions, an app with media controls should not resume playing. Apple offers notification mechanism to check when interruptions begin end finish (use AVAudioSessionInterruptNotificaitions). For applications dealing with YouTube and other video services it is essential to check connection reachability and slow connection otherwise users will be confused with a blank screen. Apple offers really powerful solutions for playing media in your iOS application. If you just want to play videos, you can use the native iOS AVPlayerViewController providing the standard user experience. To get deep access to media or build a complicated media player, you can dive into the power of AVFoundation, which has the comprehensive list of options. For YouTube, you can use both out-of-the-box solutions and third-party libraries, but only in case if the features in your application comply with Google’s terms of service. Apple also encourages developers to follow iOS Human Interface Guidelines such as handling interruptions or plug-in headphones by providing detailed descriptions and mechanisms to deal with it. I'm passionate about iOS development and enjoy immersioning into the new technologies.